Condition: Generally good for high age. Some damage to one side, some loosening of selvedge along the top. Lower pile in places. Minor dye run. The plainweave back to this storage bag is no longer there. Notes: A lovely antique juval or storage bag. This would have been used as portable storage 'furniture' in a tribal Turkoman yurt or tent. It is very finely woven and uses the classic Tekke juval guls, both minor and major, and has climbing plant-like motifs in the elem. 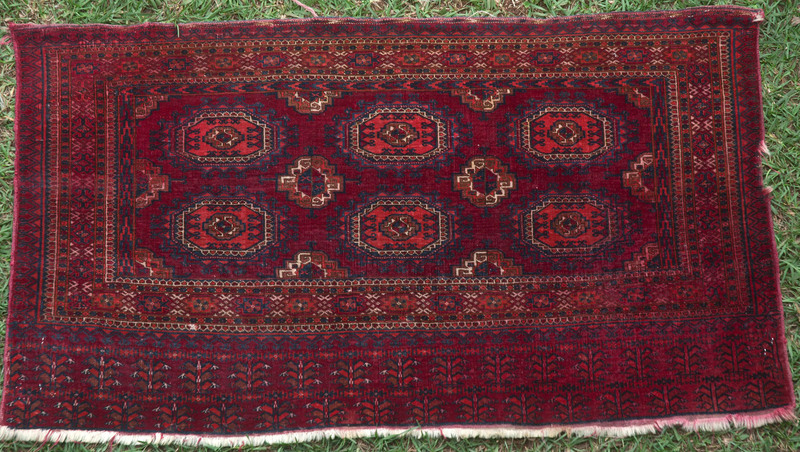 The dyes are natural and the mauvish, blue-red of the ground is typical of these Tekke pieces.